Saltwater flies are as varied as the many types of fish they are designed to entice. There is however, a common theme that categorizes the patterns by the type of food sources they imitate. 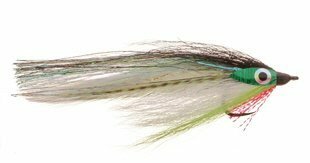 With little exception, Saltwater fly patterns are designed to imitate baitfish, squid, shrimp, or crab prey species. We have cataloged our Saltwater fly recipes by the type of fish species they are intended for. This includes broad multi-species categories like Big Game or Surf fly patterns as well as finite categories like Bonefish and Tarpon.